Who has 8 fingers and is part of Team Heal? The leveling game has been redesigned. My favorite race has a new class. Time to roll an alt. Meet Walkitoff the grumpiest pint of healing you ever saw (until you meet my wife formerly known as The Cranky Healer). So here is my initial take and rules. 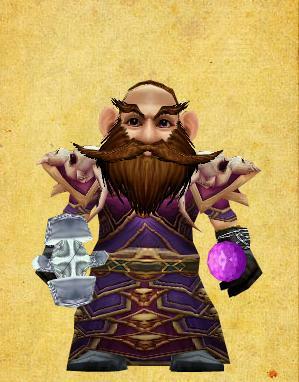 First off I’m taking all my cloth heirlooms and giving it to the gnome. Sorry Charlie, it may not be a “pure ” leveling experience, but I have stuff to do. I’m leveling discipline. I see you walking around with the loot I want and I’m like SMITE YOU! Oooo-ooo-ooo. The silver in my pocket just isn’t enough so I’m like SMITE you and SMITE her too! There are fewer than before. Some are new and relevant to the world changes. Some have been tweaked. For example previously you needed to kill Wendingos for hides. Now, just go kill some and come back. It speeds it up and makes the whole process take less time. Quest hubs that have two or three quests are almost always directing you to the same area so the bears you have to get bear rump from are mingled with the spiders you need to kill. Very nice for efficient and directed gameplay. There are also generally fewer mobs in a group. Previously, the troggs you have to kill for the early Loch Modan quests were close enough together you had to overpower them some if a pull went bad. Now they are spread out so much that accidentally pulling two seems highly unlikely. The breadcrumbs leading you from one quest hub to another are pretty straightforward. They are generally more fun than before. You feel like you are accomplishing things and making progress. Everything seems to have a purpose. They do a very nice job of directing you with quests to see all of the zone. Just by doing the quests it is completely probable you will get the exploration achievement in the process of doing all your things. The changes from the shattering are also evident in sometimes subtle ways. There are caves I remember from before that were Frostmane Troll stomping grounds. But with Azeroth’s ground opening up more, the Troggs have over run that cave and now you quest through seeing all these Frostmane Troll corpses littering the ground. The drained Loch is also pretty impressive. You see remnants of the dock, the shoreline etc. It feels like something important has changed. Other things have shifted slightly like the Orge area is further west than I remember, but it feels fine. Lots of flight points. Perhaps one of my biggest complaints about the Old old world was having to walk everywhere as a noob before having a mount, now major quest hubs and even some minor ones have their own flight point. The Gol’Bolar Quarry Mine for instance has a flight point. It is a small thing, but it helps a lot. This is not my first priest. I have previously leveled a priest to 30, twice before losing momentum. So far, I feel you get a healthy pace of introduction to new abilities as you go. In fact, at the very beginning you don’t even have a heal, you just have smite. By level 10, I chose discipline and it made me feel very powerful throwing penance at things’ faces. Having lots of experience as a mage and a decent amount of time playing a lock, caster DPS feels natural to me, and through the 27 levels I’ve played so far I don’t feel gimped at all despite playing a healing class and in a healish spec. Previously, at this point in my leveling life, I would have been shadow, because the old wisdom was “shadow to level, anything else would take too long”. I like that I feel I have a choice in what I play and not feel penalized for not going down a given path. What I am really curious about is if a Discipline spec at max level could be a viable dps spec. At level 16, I queued up to see how I’d do at healing. I ran Ragefire twice and Deadmines once. My group was 4 gnomes and a human hunter (we ran through two of them) and then the Human hunter dropped and we got a Night Elf Hunter. I didn’t find healing (and bear in mind I have heirlooms) that challenging at that level, so I figure a true beginner would probably not be a huge liability if they went healing early in the game. Ragefire is still pretty boring, kill trash get the boss. The deadmines got a major facelift which is weird since I thought of the Old World dungeons it was one of the better ones especially at the late teens through early twenties. The best part is that it auto prompts you that a quest is available in that instance as you go. So maybe there are some additional quests you’d pick up in Westfall I don’t know, but completely ignorant of that I still had 3 or 4 quests presented to me. The boss fights are more complicated than before. There is a real sense that they are teaching you not to stand in the ick early on. The bosses are new, the geography is the same. And the final boss was a good choice for the redesign. As of last night I have only died once through 27 levels. Freaking Deathwing. I was about to log off for the night settling into the inn and boom! Dead. I was kind of annoyed since I had the “perfect game” going til Zelmaru told me people are complaining about not getting the achievement and have tried camping in places to get it. So then I felt like a jerk. In case you are wondering, I was in the Wetlands in the inn in the marsh up north near that crappy windmill. I am pretty happy playing and leveling a priest. Zel says she loves Discipline but doesn’t like the idea of a smite spec (healers heal not DPS!). But I’m thinking in a raid fight where 2 healers is too few and 3 healers is too many, a smite spec priest might slide in nicely. Not topping either meter but act as a great utility player. Or in a 5 man where the toons overgear it some you could smite it up and speed stuff along. Well I’m sure as hell not doing a smite spec, so ATT can be the guinea pig on that one. I’m sure he refuses to chakra… I guess we’re even. Gnome priest… that’s so evil! I am loving the new areas, it’s so refreshing leveling through them. If it makes you feel any better I didn’t notice it either until I died and was irked. The low-level experience is awesome compared to what it has been. I’m only lvl 20 now, but I feel powerful as an enhance shammy. Just need to learn how to not pull aggro in a dungeon. Might have just been a crappy tank. Thank you so much! I just rolled an undead priest myself ( my friends and husband insisted horde grrrrr) and was somewhat curious about dicipline. I ended up choosing shadow because my husband was a shadow preist back in BC and he had fun with it. I may respec if the damage isn’t too low.